Remove bumper cover from the vehicle. Using a door trim panel tool or a Torx head driver loosen and remove all the clips/screws that are holding the bumper cover to the vehicle. 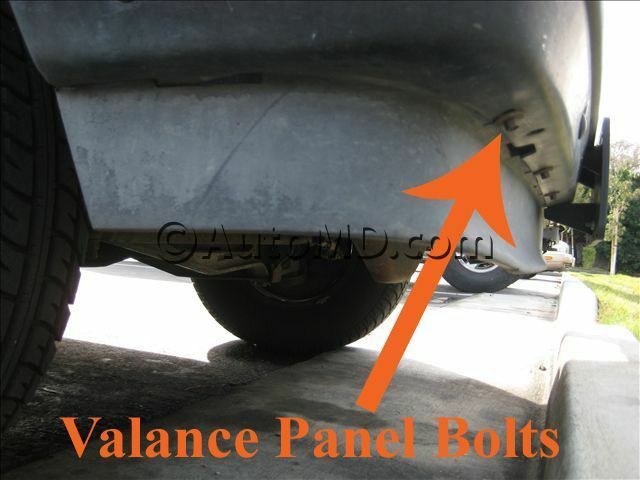 Remove the valance panel from the bumper cover, by removing the clips that hold it on. Remove any lamps or reflectors from the valance panel. Clean the new valance panel so that it is free of dirt. You will need to prep the entire valance panel for paint. Do this by cleaning the entire panel with an alcohol water mixture. Then do an initial wet sand and scuff of the paint with a Scott's bright pad and clean entire panel again. Spray primer to the damaged area on the valance panel. Mix and apply the basecoat paint to the damaged area. Use a blending technique to blend the paint into the rest of the valance panel. This will allow a smooth transition of the new color into the old color. Allow the paint to dry before a clear coat is applied. The best technique is to bake the paint in a booth to help speed up and dry the paint for reapplication. Apply the clear coat application across the entire valance panel with a similar technique as the basecoat. Allow clear coat to dry. Bake to help speed up process. Check for nibs in the paint (nibs are trash that has become stuck in the clear coat during application). Remove any large nibs with a sharp razor blade. Soak some 1500 grit sandpaper in soapy water. Add some soapy water in a spray bottle and spray on painted surface. Use a block with the sandpaper to help apply even pressure when sanding. Sand the area in a circular motion until all the trash is removed. Repeat the process with 2000 grit sandpaper that has been soaked in soapy water. Wipe the part down with an alcohol water mixture and re-inspect for trash. Use a three stage compound polish to remove any swirl marks left from the sanding. Reinstall the valance panel to the bumper cover with new clips. Reinstall the bumper cover to the vehicle.